When former Google X team lead Babak Parviz announced his departure for Amazon a few days ago, the future of his creations were somewhat cast into doubt. He spearheaded the creation of Google Glass and “smart” contact lenses, and while Google Glass continues to receive evident refinement in the form of software updates and hardware revisions, it was unclear how far the lenses had progressed along the development pipeline. The search giant broke the silence yesterday, thankfully. Google announced on Monday that it would join forces with pharmaceutical company Novartis to test and market the lenses, which transmit glucose levels by reading the level of sugar in tears. The contact lenses are a huge improvement over traditional methods of glucose measurement, almost all of which require drawing blood. The lenses may serve the additional function of correcting vision “in a manner similar to the lenses of an autofocus [camera],” according to the Wall Street Journal. It’s unclear how that technology would be implemented, but it’s a feature Alcon, the eye-care unit of Novartis, may pursue. Novartis hopes to have prototypes available for research reviews by early 2015. 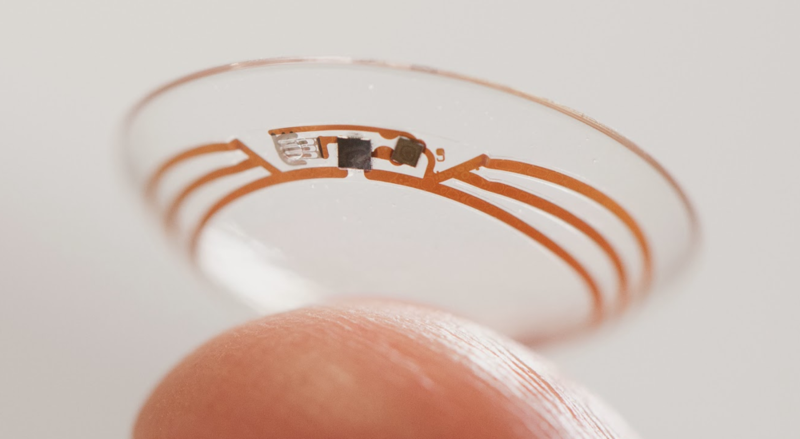 Taking into account the relative absence of smart contacts on the market, that may sound like a lofty goal, but hopefully Google’s involvement means the lenses see commercialization soon.